The first year seminar courses are academically engaging with an additional emphasis on transition to college issues. All seminars feature a plethora of activities and opportunities to introduce students to IC's bounty of events, student groups, and academic and community services. “The power of our words was all the spectacle we needed." Three weeks. That’s all the time the students in the first-year seminar class U.S. Social Activist Theatre and Performance: History and Praxis had to create a theatrical production from start to finish. They first studied the concept and history of activist theatre. Next they interviewed students on campus and then used those interviews to create a script. 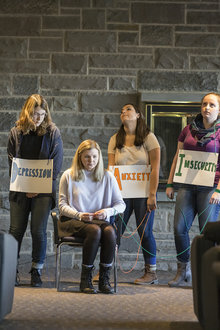 The finished production, Student Vs., portrayed Ithaca College students’ struggles with ignorance and insensitivity surrounding race, mental health, and power dynamics on campus. Activist theatre isn’t like conventional main-stage productions. It challenges social norms and encourages discussion, often promoting awareness of injustice. “It’s a reflection of the controversial parts of society we often avoid discussing,” Joe Cruz ’19 said. Instead, the students focused on powerful language, including elements of slam poetry. “The power of our words was all the spectacle we needed,” Cruz said.